Made in Germany with the top-notch quality of Zeiss, the Conquest 10×42 binoculars are the best of the entry-level premium binoculars on the market. They are made using only the very best of construction materials and carry Zeiss’ reputation for long-term use, durability, and reliability. Should they ever break or need replacement, however, they are backed by a lifetime, transferable limited warranty and a five-year non-transferable repair policy that allows the owner to send the binoculars back for repair or replacement without service charge for the first five years after they register within sixty days of purchase. With the binoculars comes a premium carrying case with comfortable neck strap, lens covers, and a lens cleaning cloth. Many people have said that the lens covers don’t stay on very well, however if adjusted on the lenses properly, they stay put. The chassis of the Conquest binoculars is aluminum, which is lightweight and sturdy. It also resists corrosion. Over the aluminum is rubber armor with a soft, non-slip grip that is sure to please. The rubber also provides a non-reflective surface that is great for observing timid animals in their natural setting. The ability to mount these binoculars on a tripod is a major plus, as it allows you to steady the binoculars better than you could with just your hands. However, you have to get a Venofix tripod adaptor, sold separately, in order to mount them. The rotating and lockable eyecups of these binoculars were designed to be usable by eyeglass-wearers and non-eyeglass-wearers alike. Adjustable according to the desire of the user, they are comfortable on the face, though some say the eyecup is not long enough. Zeiss solved this by offering a longer eyecup to anyone who feels they have a need for it. At 17mm, the eye relief is long enough for any eyeglass-wearer, without being cumbersome for non-eyeglass-wearers. Located by the right eye piece, the diopter adjustment wheel allows you to adjust the individual barrels separate from each other. Unfortunately, the wheel is only wide enough for one finger, so it’s not as easy to turn. Also, it doesn’t lock, meaning a slight bump can mess up your barrels’ focus. The lenses that are exposed to the air are sealed with O-rings, preventing dirt, debris, and moisture from entering the binoculars. The interior is also nitrogen-purged, preventing fogging. The amazing clarity and sharp image of these binoculars partially derives from the dialect mirror coating. This mirror improves light transmittance and encourages an excellent field-of-view. The extra-low dispersion glasses and high-density lenses enhance resolution, color, and contrast, creating an image that is sharp and precise. The lenses on these binoculars are fully multi-coated for all-weather use. They have a LotuTec water shedding outer coating, as well as being fully armored and waterproof. *means water rolls right off the This means that dirt and smudges are easily removed, and the chance of scratching is greatly reduced. Zeiss binoculars are made with the very best of BAK-4 prisms. The first coating on these prisms is a phase correction coating. Necessary because roof prisms cause phase shift, phase correction coating enhances resolution and contrast. This leads to a better, sharper image that is easy to distinguish from non-coated roof prisms. The second coating, as mentioned earlier, is a dielectric multi-layer Prism Coating. Roof prisms have one side that is does not have total internal reflection, creating a light transmittance problem. Some roof prisms get a metallized mirror surface to help prevent this problem, but the best quality binoculars have a dielectric mirror, as it can transmit 99% of light. This creates a brighter, clearer image. A field of view of 354 feet at 1000 yards allows you to get up close and personal with whatever you’re viewing, even if your target is a great distance away! On the other hand, the near focus of these binoculars is a close six and a half feet, creating the perfect image for viewing nearby wildlife, such as insects just a bit over two yards away and deer within hunting range of your tree stand. If wildlife is your target, image tracking is a must-have for you. These binoculars’ sharp image tracking allows you to see an animal as it takes off or blurs past you, without the blur of course. This is especially useful for tracking and watching timid animals. These binoculars have one of the sharpest image contrasts on the market. They are certainly no exception to the golden rule of Zeiss products. They can pick out distant objects with strong contrast and a clear, precise image. The color reproduction is almost flawless, as well, and this means that from a great distance, you can see what species of bird you are viewing and whether it’s male or female. 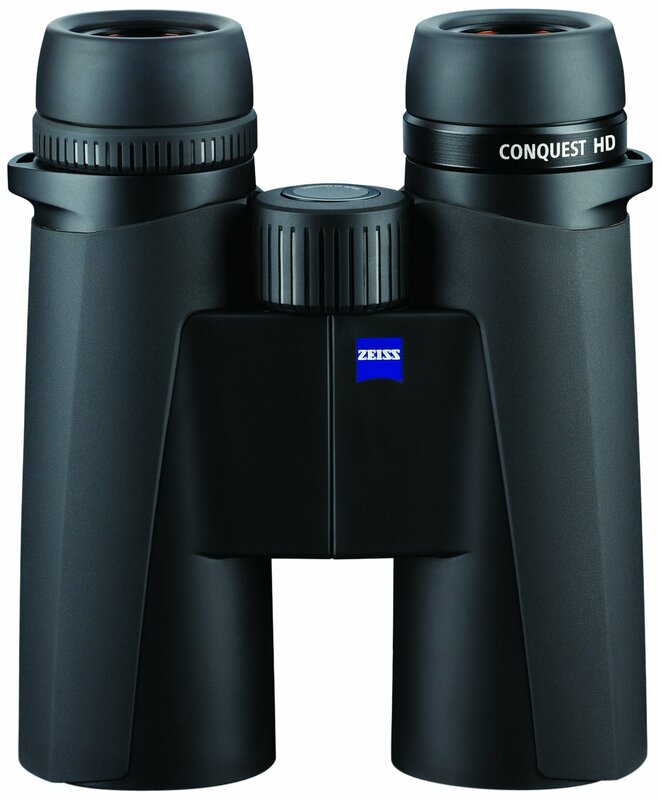 Overall, you cannot go wrong with these Conquest 10×42 binoculars from Zeiss. They are a great entry-level premium pair that has all the quality and sharpness of the other Zeiss products. Lightweight and sturdy, they will not break easily, but a limited lifetime transferable warranty is there to back them up in case they do break.